A new space from a CBD-infused sparkling water brand has been created for creatives to relax and connect with others. 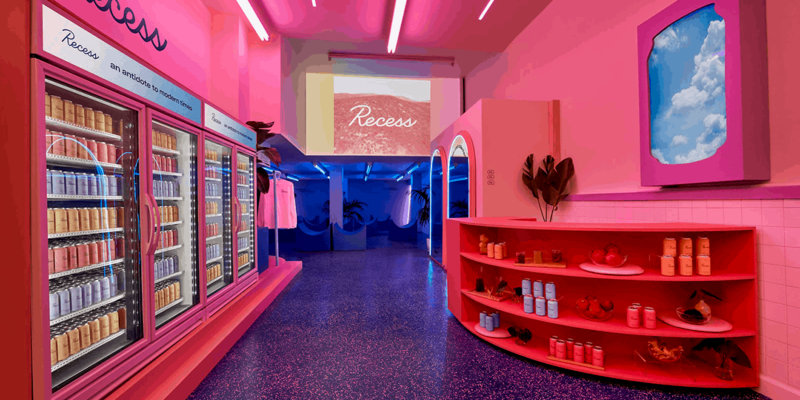 When you step inside Recess’ new pop-up, located at 680 Broadway in New York, it’s like stepping into a laid-back, neon-filled coffee shop. 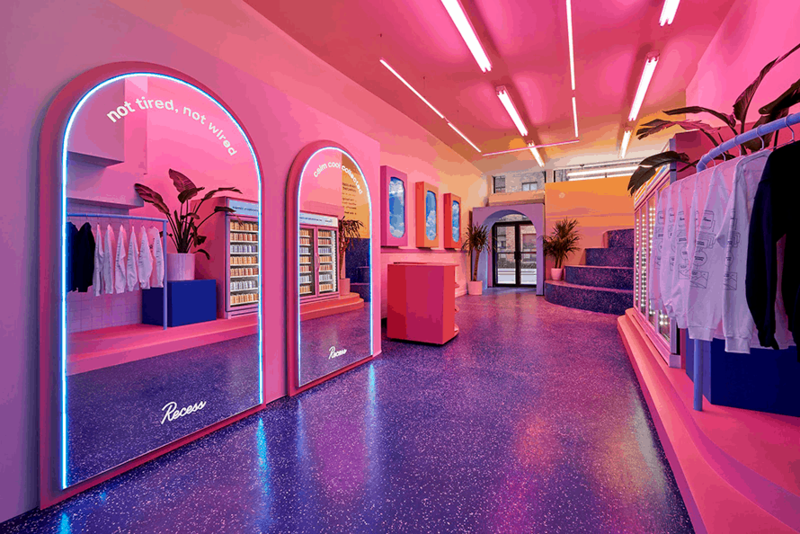 But instead of enjoying a cappuccino, anyone who steps inside this space, aptly named Recess IRL, will crack open a cold sparkling water infused with hemp extract and adaptogens, essentially CBD sparkling water designed to help you relax and spark creativity. The space, which opened Wednesday and will be around for at least three months, according to the brand’s founder Benjamin Witte, will serve as a way for the company to gain awareness in key markets. New York City is a big one for the brand, but Recess has plans to open pop-ups in Miami, San Francisco, Los Angeles and other cities. 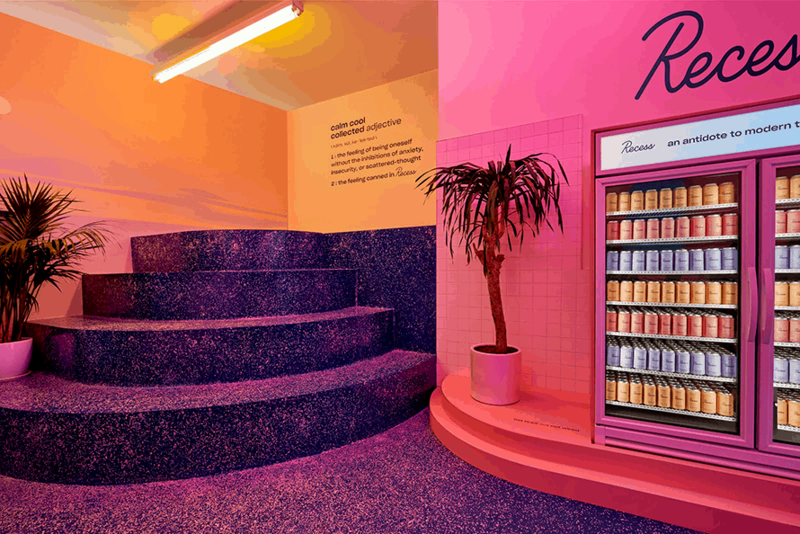 The mission of the pop-up isn’t to sell sparkling water, although the NYC space is equipped with fridges filled with the colorful cans on Recess, which come in blackberry chai, peach ginger and pom hibiscus that are for sale. The idea is to draw people into the space to learn more about the brand and to chill out. It’s also a place for Recess to grow a community of followers. 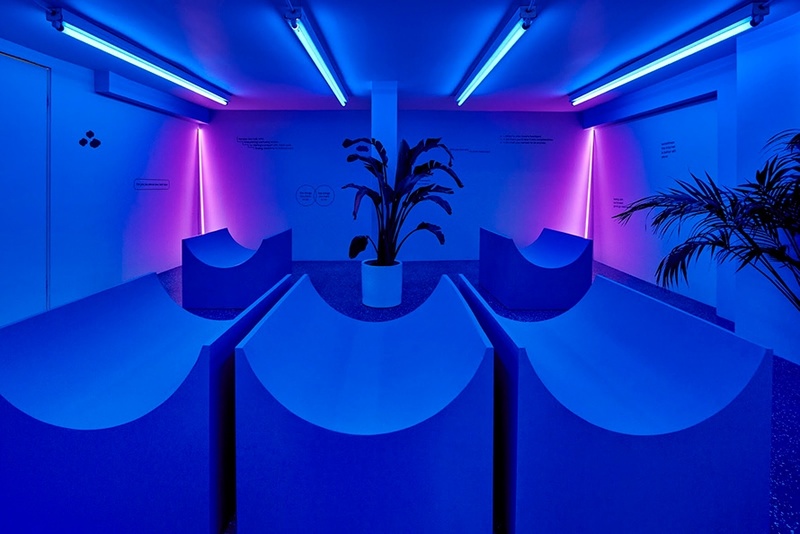 To date, the brand’s marketing has been done solely through Instagram, so the physical spaces will be a way for people to learn about the product and get a sense of what the brand stands for: the idea that Recess has “canned a feeling” or given people a moment out of the day to rebalance and relax. You won’t see the words CBD plastered inside the space either, and that’s an important choice Witte and his team made when they were working with Gin Lane and Day Job Studios on the branding ahead of Recess’ launch in October of 2018. Four nights out of the week, Recess IRL will be used for programming and events. One of the first sessions, coming up on Sunday, Feb. 12, will bring brand Luxury Escapism into the space for “An Oddly Satisfying Sunday.” At the back of the space, there are chairs (see in the image below) designed so that people can choose any number of ways to sit in them. Again, everything is meant to make people feel comfortable, take a break from the outside world and spark some sort of creativity. 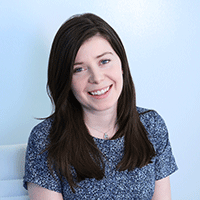 “The programming is the most exciting part to me because I don’t feel that there are that many brands that speak to the creative community,” Witte said. “The brand is almost designed for graphic designers, and I think that idea is so untapped in the wellness world,” he added.